I realized that I never gave an update to our Number the Stars Facebook character analysis! To finish up the Facebook page, each group decided on something their character would write on each of the other characters’ “wall”. They typed this up and we attached them to the page, so each character has a wall post from the other three. They were so creative! They also typed up their list of character traits and support (a quote/phrase from the book) and we included this under “Analysis” on the back of the page, under the wall posts. 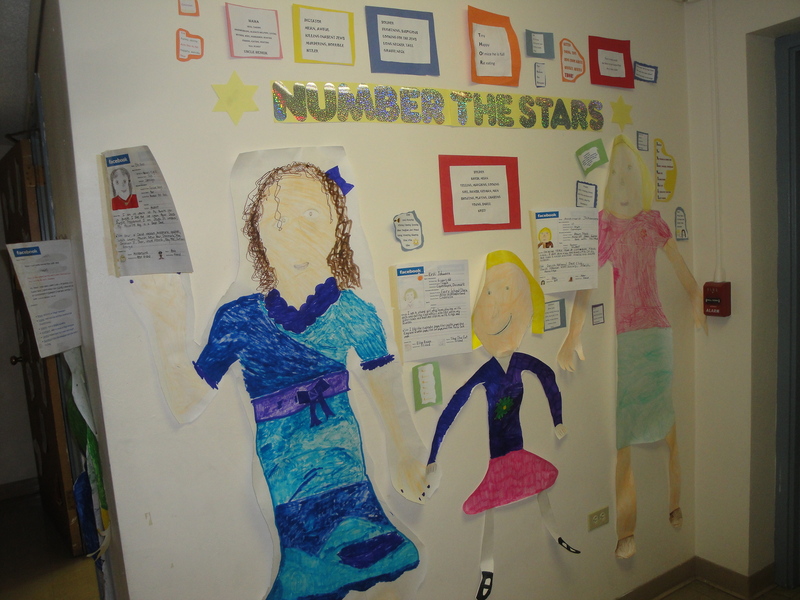 After the Facebook pages were done, each group created a life size cut-out of their character, adding physical features as described in the book. We hung these up in the hallway, along with the Facebook pages. The students also wrote poems about characters from the book, so we hung these up as well. The display looks awesome! Unfortunately, our classroom is on the top floor – it is only 4th and 5th up that high, so not too many people ever venture up to see it. But we have gotten many compliments from parents and others who have passed by. Can you think of other fun ways to incorporate this into your classroom? I was thinking that it would be fun to do when learning about famous people from history, such as presidents or inventors. Any other ideas?? As I mentioned in my last post, we are currently reading Number the Stars by Lois Lowry. The kids are SO into this book – every day, they beg to read “just one more chapter”! In order to help my students get a better look at the characters in the novel, they are doing a character analysis in groups. Each group chose a character from the novel to focus on. Their first task was to create a list of 5-10 personality traits as well as quotes/sentences that supported each trait. They next made a list of physical traits, describing what their character looks like. If it wasn’t talked about much, I had them describe what they THINK their character would look like. 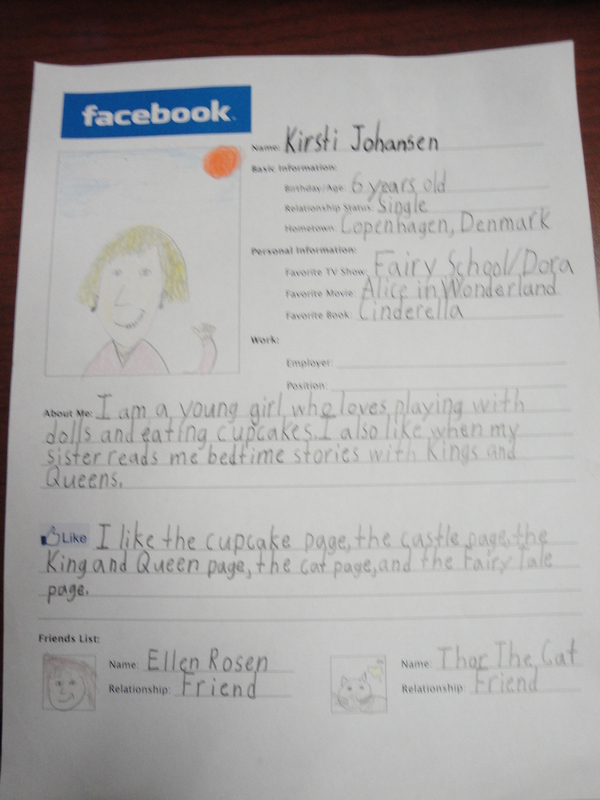 I then explained that they would be creating a mock Facebook profile page for their character – and let me just say, they got SO excited! Most of them know what Facebook is due to a parent or relative having an account, and they thought it was so cool that they would get to make one for someone! I created a mock Facebook profile page for each group to fill out about their character, which includes information such as birthday/age, relationship status, hometown, favorite tv show/book/movie, about me, and “likes”. It also has spots for two “friends” at the bottom, including their picture, name, and relationship to the character. On the back, there is room for “wall posts” from other characters – I plan to have my students write on each other’s “walls” as their characters. There is also an analysis section, where I will ask the students to write their list of character traits and support from the book. My students started working on this today and were having so much fun! They were asked to create a rough draft of sorts, so that they knew what they were going to write on the actual page and could copy it neatly. They used what they knew about their character from the book to create the page, and they are looking great so far! Do you do anything like this with your class?? I’d love to hear about it! !